Because the air inside our homes is often up to 5 times dirtier than fresh, outdoor air, it’s pretty often our clients have questions about ways to improve their home’s indoor air quality. UV lighting systems are one of the very best ways to breathe cleaner, healthier indoor air 24 hours a day. UV Lighting systems are an active form of indoor air filtration. As the air in our homes moves through the duct system it is filtered through either a typical air filter or hopefully through a high efficiency air cleaner. We can clean up the air in our homes even further with the use of UV lighting systems. UV lighting is installed in the ductwork of your HVAC system. As airborne particles like viruses, bacteria and mold pass through the rays of UV light, they are neutralized and no longer a threat to your health. 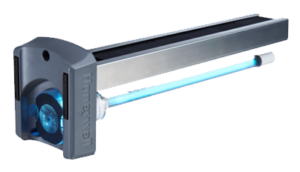 In fact, with only 30 minutes of operating, UV lighting and air scrubbing technology can reduce 90% of pathogens in the air. In addition to removing airborne germs, our preferred UV systems are extremely effective at eliminating odors, VOCs and gases that are harmful. During the winter months when spend most of our time indoors breathing the same dirty air that’s cycled through the heating system all day, it’s no wonder so many of us catch colds and flus. We can all benefit from healthier air 365 days a year. With the right indoor air quality systems, we can help to make sure you and your family stay as healthy as possible and eliminate aggravating sinus problems and headaches, etc. Get in touch with us and we would be happy to evaluate your system and put together some exciting indoor air quality options for you and your family.